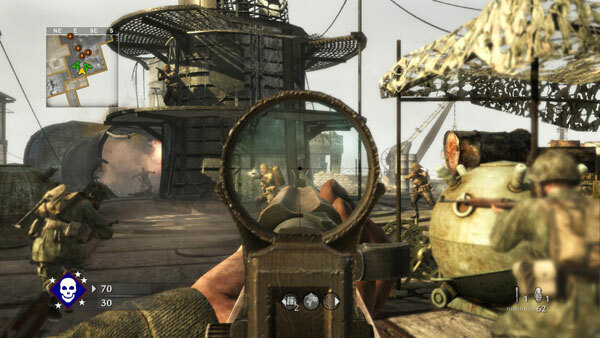 Activision has released “Call of Duty: World at War Map Pack 3” for download on the Xbox 360 and Playstation 3 game consoles. 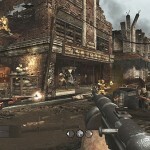 The pack, which costs 800 MS Points with Xbox LIVE and $9.99 at the Playstation Store, includes three new multiplayer maps and one Zombie map. In other Xbox news you can now use PayPal to purchase content on Xbox Live. The service is limited to the U.S. however, and you’ll still need to go that extra step and apply credits via Xbox.com rather than straight through the console. Xbox games are also going “live” on Xbox Live. Several titles will be available on Aug. 11 for download, averaging $20-$30, or 1,600 and 2,400 Microsoft points. Here are details on the new ‘Call of Duty’ map — have fun. • Battery: An armored island surrounded by anti-ship mines and shore-to-ship cannons, “Battery” places soldiers on a mid-sized map based on Fort Drum (El Fraile Island) in the Philippines. 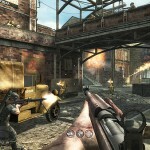 Players will have plenty of areas to hide and a steady flow of close quarters combat! • Revolution: “Revolution” pits soldiers against each other in a large factory set in Russia’s cold city streets. 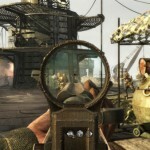 Keep your trigger finger primed, your gun loaded, and your head low through this sniper-friendly territory! • Breach: Overwhelm the enemy in “Breach,” set in Berlin’s crowded city streets surrounding the historic Brandenburg Gate. Only the finest soldiers will survive in this fast-paced, dense battlefield! • Der Riese (Zombie Factory): The undead horde approaches! 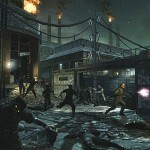 Fight for your life in “Der Riese” (translated: “The Giant”), an all-new Zombie map set in a secret Nazi research facility featuring the Pack A Punch Machine, a device capable of upgrading weapons at the touch of a button. Use the teleporters to escape the vicious Hell Hounds and pray that the powerful Wunderwaffe DG-2 will appear before it’s too late. This map includes 10 new Xbox 360 Achievements/PS3 Trophies. this game is an awesome deal at $10. like having a whole new game. get it! I think activision will caught blizzard in less than 3 o 4 years!! they are doing great games innoving! !